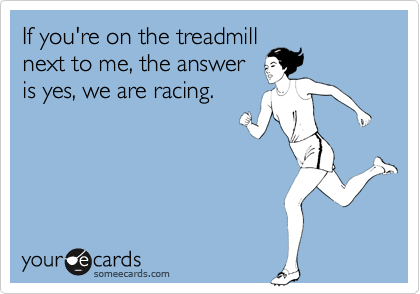 Are you guilty of treadmill racing? | Fit Girl. Happy Girl. Are you guilty of treadmill racing? As a new runner, I’m certainly not one who should be openly admitting this but, I will admit that I usually glance down at the speed of the runner next to me on the treadmill. It’s called treadmill racing. It’s petty and I don’t really gain anything from it, but what can I say? I’m competitive. Since I have been training for my first 5k, I’ve been doing most of my runs on the treadmill because the program calls for a lot of interval training and I find it easier to monitor my time on the treadmill. But I’ve noticed a trend at my gym among the runners to my left and right. Occasionally, my co-runners will glance down at the speed I’m running, and in turn I tend to do the same thing. It’s mostly out of curiosity but I think this bad habit can cause some people to become uncomfortable. For me, when someone next to me is running faster, instead of feeling bad about not going as fast, I use it as motivation for future runs. However, I also know that some gym-goers can be uber-competitive, making you feel self-conscience of your running. But, keep in mind, you don’t know what they are training for, whether it be sprints or distance, and they don’t know what you’re training for, so be confident in your running! Women’s Health Magazine suggests setting the time you want to run and then covering the display with a towel to ward off any wandering eyes. Don’t worry about your neighbor’s speed because it’ll distract you from your own run. If treadmill racing is too stressful, opt for an outdoor run, free of competition and numbers. Outside you are running your own speed, and no one can one-up you on that. I kind of want to go do a treadmill race now. I prefer outdoor work. My pace is better, and enjoy the turns and twists of the road. You are right though, it is much easier to do interval training on the machine.